President Donald Trump said Friday that his administration "can get around the media when the media doesn't tell the truth, so I like that." 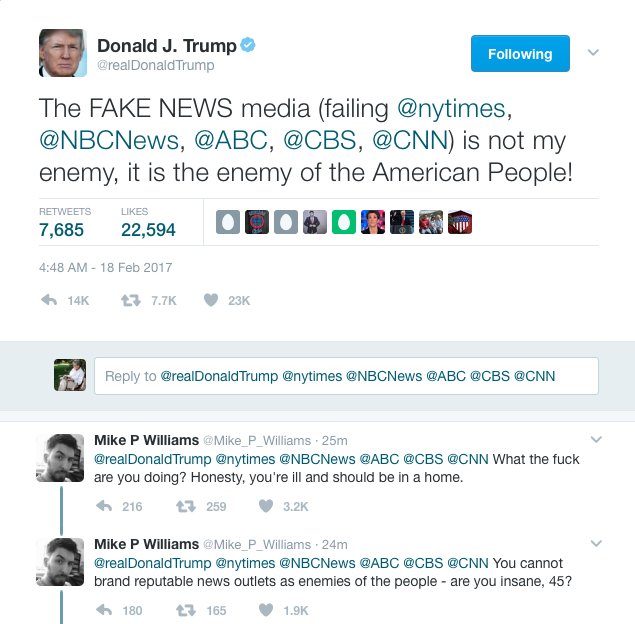 ​The president was referring to his Twitter account. But recently he has taken steps to control news coverage. The Trump administration has given preferential access to favorable outlets while excluding others -- a move critics say is dangerously reminiscent of state-controlled media. In the latest incident, Secretary of State Rex Tillerson invited Fox News to cover his meeting at the Korean Demilitarized Zone, on the North-South Korea border, but denied access to the press pool that provides all media outlets with an account of the secretary's activities. "Fox unilateral network team was allowed into this meeting -- pool asked for access and was blocked," wrote CNN's Pamela Boykoff, the author of Friday's pool report. "Local embassy official told the pool it was 'the Secretary's decision.'" Tillerson was already being criticized for refusing to allow pool reporters to accompany him on his plane during the trip, which had been a standard practice for his predecessors at the State Department. Tillerson did allow a reporter from the conservative Independent Journal Review to accompany him, but not as a pool reporter. That reporter, Erin McPike, has not filed any stories from the trip so far -- a source of consternation among other members of the media. A spokesman for IJR said McPike was with Tillerson to write a profile piece, not to write spot news stories about the trip. "There was absolutely no agreement with State" to forgo daily writing or reporting, McPike told CNNMoney. 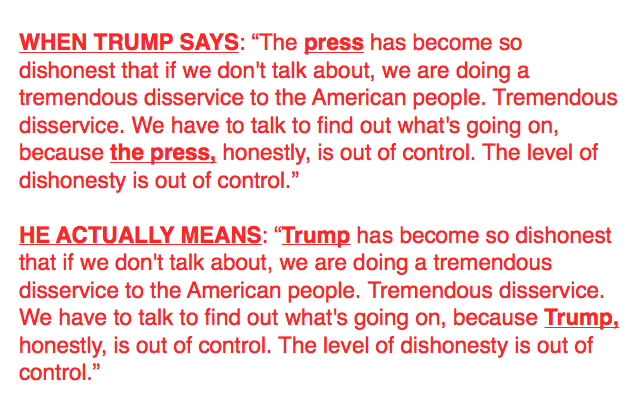 "I am also not the pool reporter. I'm doing a longer piece." McPike also said she prizes objectivity and fairness: "I completely reject the state-run media charge" leveled by some observers. On the domestic front, the administration has also given preferential access to favorable media outlets. Five of the seven in-person interviews Trump has given to the media since becoming president have gone to Fox News. 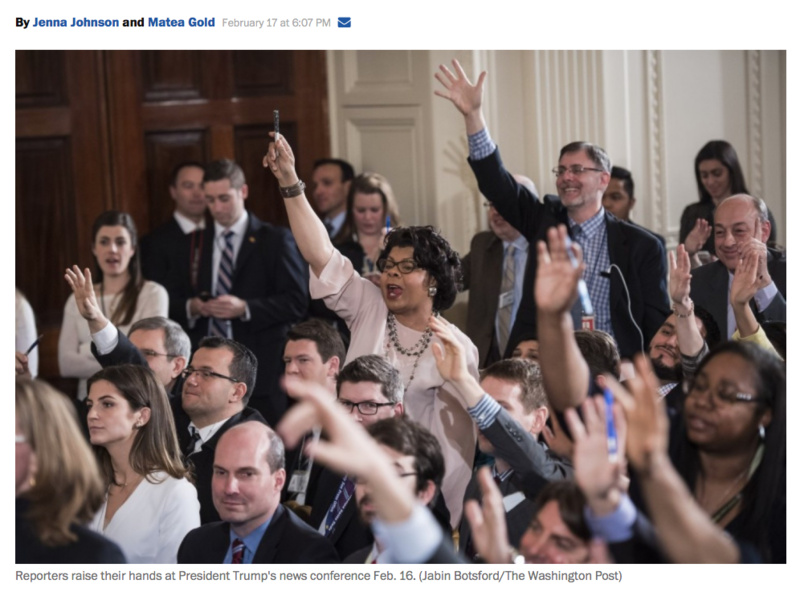 Last month, White House press secretary Sean Spicer blocked CNN, The New York Times, Politico and several other news outlets from attending an off-camera White House press briefing that other reporters were hand-picked to attend. When reporters from these news organizations tried to enter Spicer's office for the gaggle, they were told they could not attend because they were not on the list of attendees. At Friday's joint press conference, one German reporter asked Trump, "Why are you scared of diversity in the news?" Trump declined to answer that question. "ไอ้พวกสื่อข่าวปลอม ( News York Times ที่เจ๊งอยู่, CNN, NBC และอีกมากมาย) ไม่ใช่ศัตรูของผม (กู?) พวกมันคือศัตรูของพ่อแม่พี่น้องประชาชนชาวอเมริกันทั้งหลาย. อ๊วกแตกโว๊ย!" 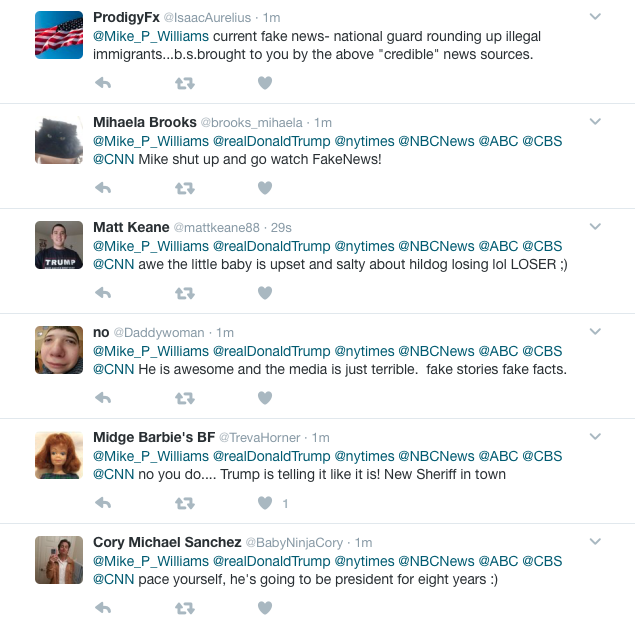 ​There is no mention of specific newspapers, websites, magazines or non-cable networks.Other questions ask whether the survey-takers think the media does “due diligence fact-checking before publishing stories on the Trump administration,” whether it fairly reported on the rollout of Trump's travel ban, whether “political correctness has created biased news coverage on both illegal immigration and radical Islamic terrorism” and whether the media has been “far too quick to spread false stories about our movement.” Participants can also indicate which issues the media does “the worst job of representing Republicans” on, with the option to pick as many topics as they like. Sign upThe social-media ads driving people to the survey were paid for by the Trump Make America Great Again Committee, a joint fundraising committee that splits its proceeds between Trump’s campaign and the Republican National Committee. Since Trump’s victory, the fundraising committee has continued to pepper supporters with appeals for money, helping keep a steady stream of contributions flowing to the party and Trump’s campaign. By the end of December, Trump had already socked away $7 million into his campaign account, money that officials said they are stockpiling for his 2020 reelection effort. US President Donald Trump has launched another fierce attack on the media at a "campaign rally for America" event in the state of Florida. He told the crowd in Melbourne the media did not want "to report the truth" and had their own agenda. He also defended the achievements of his presidency so far, insisting that a spirit of optimism was sweeping the US. 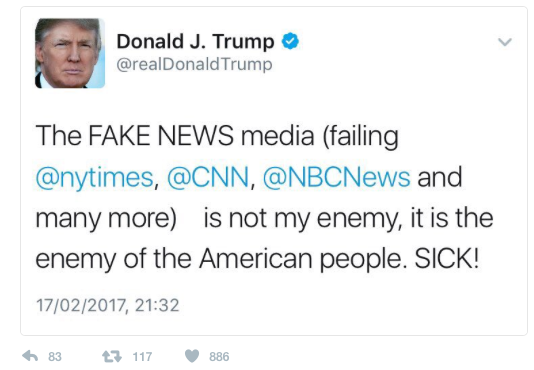 Mr Trump had attacked the media at a press conference on Thursday, as pressure mounted on his presidency. His national security adviser Michael Flynn quit earlier in the week. Mr Trump is to interview candidates for the role on Sunday. On Saturday, President Trump and his wife Melania were greeted by thousands of supporters at the rally in a state he won in November's election. Protesters have also promised to line the route to the venue. In his speech, Mr Trump said he wanted to speak to Americans "without the filter of fake news". 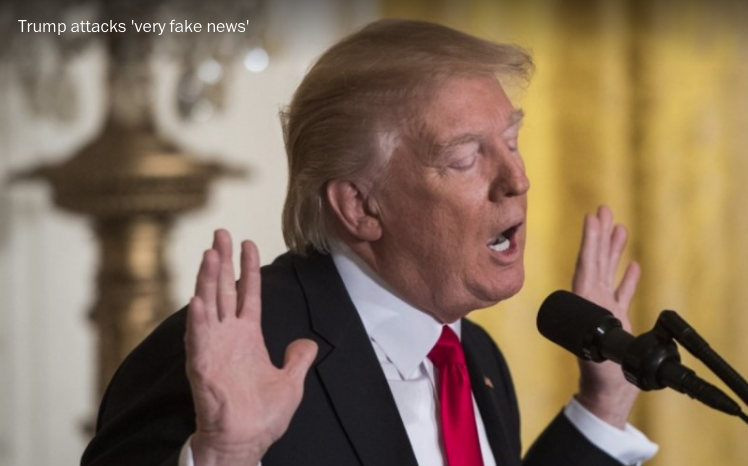 Describing the media as "dishonest", he repeated his assertion that some outlets "don't want to report the truth" and were making up their stories about him. "We will continue to expose them," he said, pledging to "win, win, win". 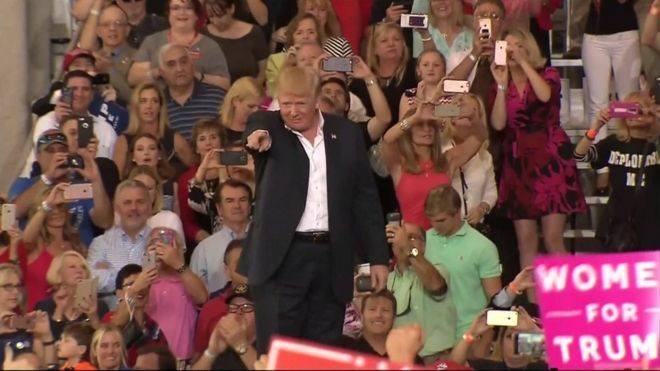 Repeated his campaign pledge to keep America "safe" and said the country would "have strong borders again"
One supporter, Gene Huber from West Palm Beach, said the decision to hold a rally was not a concern. "No jitters at all," he told the AFP news agency. "This is a world leader now who's taking control." Throughout the week, Mr Trump launched attacks on the media while indicating his excitement at facing crowds in Florida again. On Thursday, he held a 76-minute press conference where he told reporters their level of dishonesty was out of control, citing coverage of his campaign's alleged contacts with Moscow. Michael Flynn, Mr Trump's national security adviser, resigned on Monday after he misled Vice-President Mike Pence about whether he had discussed US sanctions with Russia's ambassador before his own appointment. Meanwhile, the New York Times reported earlier this week that members of Mr Trump's campaign and other Trump associates had repeated contacts with senior Russian intelligence officials in the year before the election. While in Florida, Mr Trump is staying at his Mar-a-Lago resort for the third weekend in succession. In a tweet, he referred to the property as the "Southern White House", although the private club is part of Mr Trump's portfolio and is not government property. 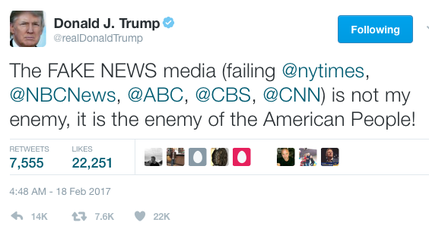 ▸ "The media did not want "to report the truth" and had their own agenda.​"
▸ One thing he speaks truthfully about the media is "the media is not my enemy".